The Cinque Terre includes five small, gorgeous villages (“cinque terre” is “five lands” in Italian) which climb to the Ligurian cliffs on the Italy’s western coast. They are usually visited as a whole, mostly because they’re so close to one another! The Cinque Terre are really dedicated to the tourists. The tiny towns are really popular among American backpackers/budget travelers and German holiday makers, and also British citizens start to go there and discovering the astonishing beauty of the land. Hiking along the cliffs from village to villages something you have to do once there. The area is almost always packed of tourists! You could rent a room just showing up and chatting any of the women in the train stations with signs that advertise rooms for renting. Now it is almost impossible during the high season. Book ahead of time so as to avoid the crowd and unpleasent surprise of sleeping in the train station! 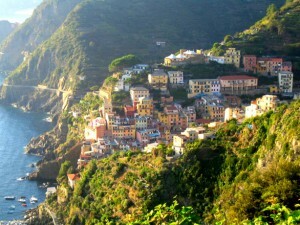 Funny to say, but many of the lodging options in the Cinque Terre aren’t on for booking online. Why? It is because many of the rooms in the villages are either rooms in someone’s house or entire small apartments for short-term rentals. Beware also because sometimes hotels and hostels that aren’t really in one of the Cinque Terre towns tend to say they’re in the Cinque Terre! Maybe it is just a short train ride from any of the five villages, but make sure where is the hotel you are going to! This entry was posted on Saturday, May 5th, 2012 at 5:27 pm	and is filed under Discover Italy. You can follow any responses to this entry through the RSS 2.0 feed. You can leave a response, or trackback from your own site. Remarkable, this is intriguing to see. Have you ever regarded distributing posts for you to magazines?